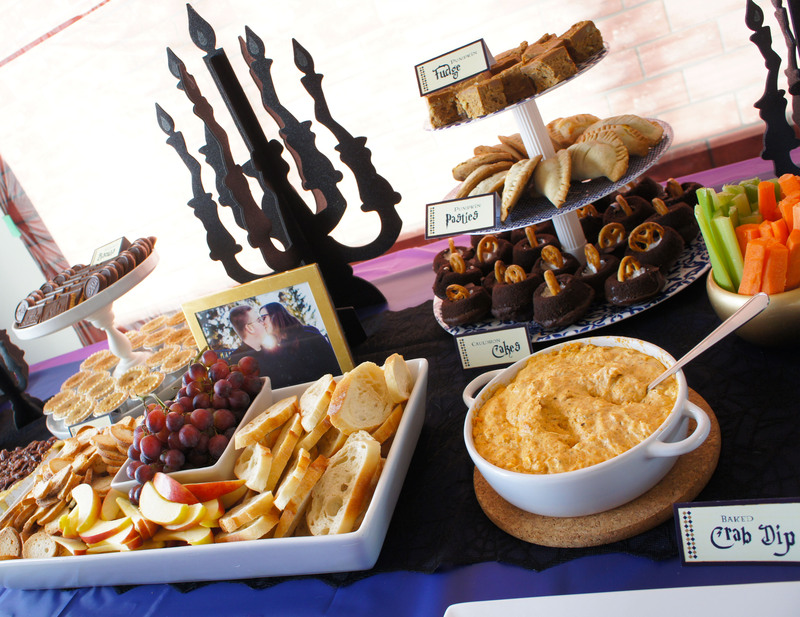 In my opinion, food is the most important element at a party. 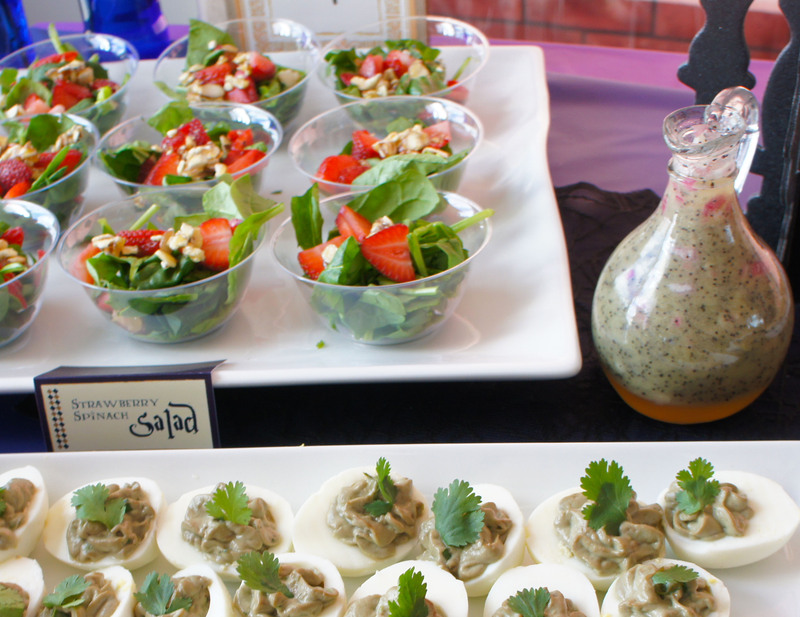 I love picking menu items that reflect my party theme and are something a little out of the ordinary for my guests to try. 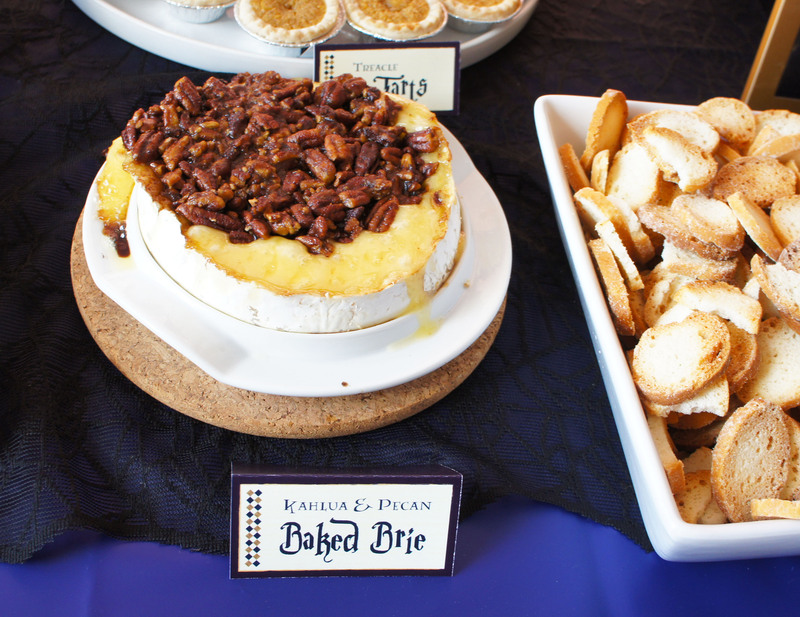 For my Harry Potter party, I wanted foods that were reflective of the great feasts described in the books and shown in the movies. 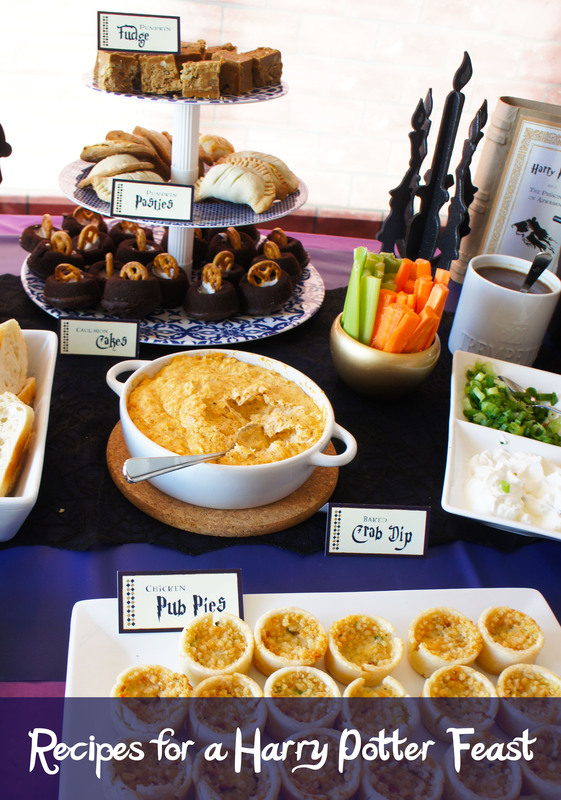 I kept it to finger foods, but chose items with a British twist. My menu included mini chicken pub pies, mini beef wellington’s, barbequed chicken wings, individual spinach salads, a Kahlua baked brie with toasted baguette and grapes, warm crab dip with tortilla chips, stuffed mushroom caps, guacamole devilled eggs, a mashed potato bar and a variety of pastries and cake. These were a bit of a last minute addition and one of the biggest hits on the food table. I normally do mushroom caps stuffed with a breadcrumb mixture, but I was looking for a good option for my party guests with gluten issues. The Pioneer Woman uses grated gruyere in her original recipe, but I kept it simple by using pre-sliced swiss cheese. In a medium skillet, melt the butter over medium heat. Saute onions in the melted butter, 15-20 minutes until soft. Add in the wine, beef broth and Worcestershire sauce and cook for another 5 minutes. Once liquid is cooked down, set aside. Clean mushrooms and remve stems, then spread on a cookie sheet. 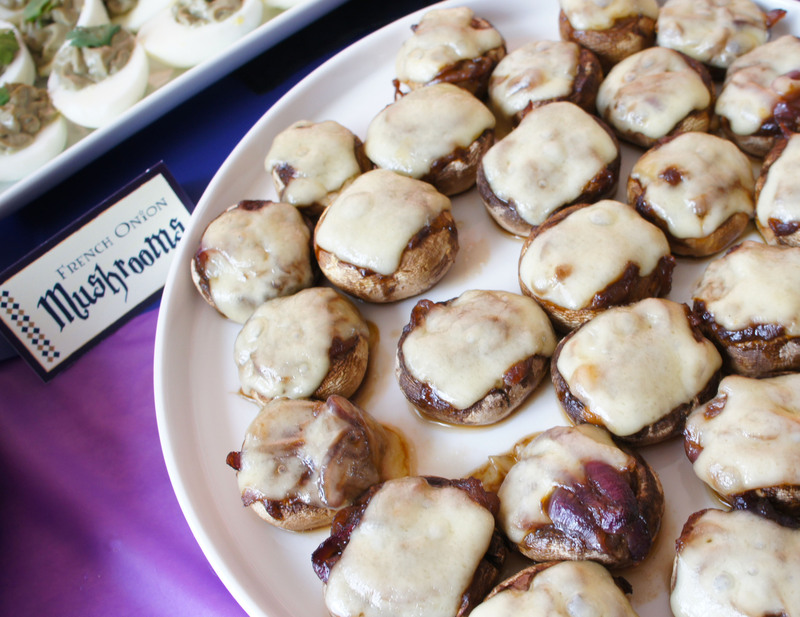 Fill each mushroom with some of the cooled onion mixture and top with a small piece of the swiss cheese. Bake 10-15 minutes at 350 degrees. If desired, place under a broiler for the final minutes to brown the cheese slightly. Sprinkle with minced parsley and serve warm. Melty, gooey and oh so tasty! This was my favorite and is definitely a recipe I will be repeating. It is only 4 ingredients but the end result is both impressive and delicious. The original recipe, with much prettier pictures then my lopsided mess, can be found at My Life as a Mrs.
Use a sharp knife to score around the top edge of the brie and remove the entire top circle of rind. Place in brie baker or center of an oven safe platter. Mix the pecans, brown sugar and Kahlua in a bowl. Spread mixture over the top of your prepared brie. Bake in preheated oven for 8 – 15 minutes. The brown sugar mixture should begin to bubble, but the cheese should still be holding its shape when done. Serve warm with your dippers. This was my least favorite recipe to prepare due to the fact that I still haven’t found the perfect way to take the shells off a boiled egg. The guacamole filling was a prettier green a couple hours before the party when I prepared them and put them in the fridge, so I would recommend making these up last minute to serve to guests. 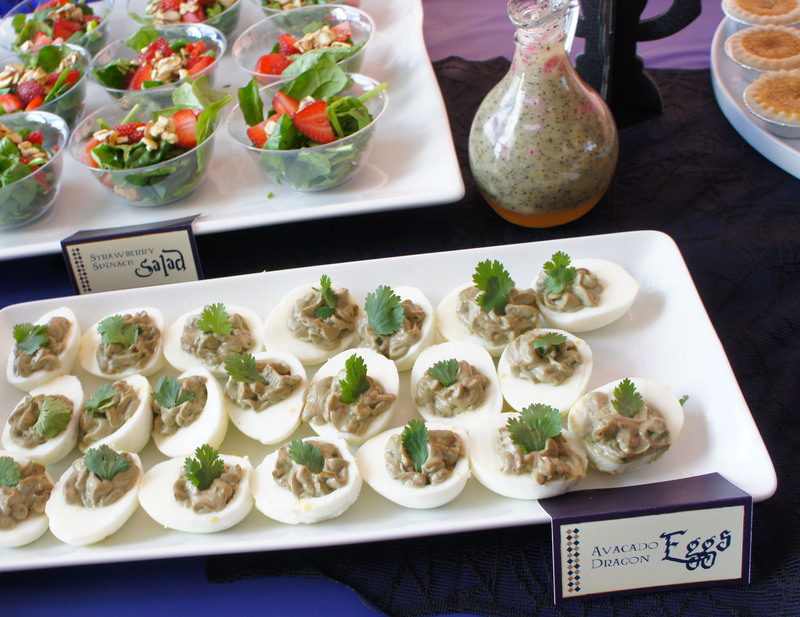 They were a nice change from the traditional devilled egg and the color worked with the Dragon Eggs label I gave them. The original recipe was found on Simply Recipes. Peel the hardboiled eggs and slice in half lengthwise. Carefully coop out the cooked yolks and arrange the egg whites nicely on a platter. Cut the avocado in half, removing the pit and scooping out the flesh. Place in a bowl and roughly mash with a fork. Mash in 2-4 halves of cooked egg yolk into the avocado. Sprinkle with lime juice and salt. Stir in the sour cream, chopped cilantro, jalapeno pepper and green onion. Fill the egg whites with the avocado mixture, using a spoon or piping bag. Garnish each with a cilantro leaf. In the past I have always just bought bottled poppyseed dressing for my spinach salad because it seemed like something that would be complicated to make. Because of my guests with gluten issues, I opted to make my own this time just to ensure all ingredients were gluten friendly. I was shocked how easily this dressing recipe from Dine & Dish came together and how delicious it was. I don’t think I will be buying bottled poppyseed dressing again! For the candied almonds: On the stovetop, pour 1/4 cup sugar into a heavy skillet and slowly melt over low heat. Once it has liquefied, add almonds and stir to coat. Spread the coated almond mixture onto a foil sheet to cool and then break apart if necessary. To make the dressing: Whisk together the vinegar, sugar, finely chopped onion, dijon mustard, and salt. Once thoroughly combined, gradually add in the canola oil and then stir in the poppyseeds. To make the salad: Layer the baby spinach, chopped strawberries and sliced onions in a large bowl or individual dishes. Top with a small handful of candied almonds and pour on the poppyseed dressing to taste. This is not really a recipe, but I am sharing because it went over so well at the party. My co-host was kind enough to prepare a large batch of mashed potatoes and I provided a variety of toppings for guests to use to dress up their potatoes. We served the potatoes from a large plastic cauldron and small plastic bowls from Dollar Tree worked perfect for the individual servings of potatoes. Our toppings included gravy, sour cream, cheddar cheese, green onions and bacon bits but I have seen other more elaborate examples of potato bars that include items such as grilled shrimp and sautéed mushrooms. 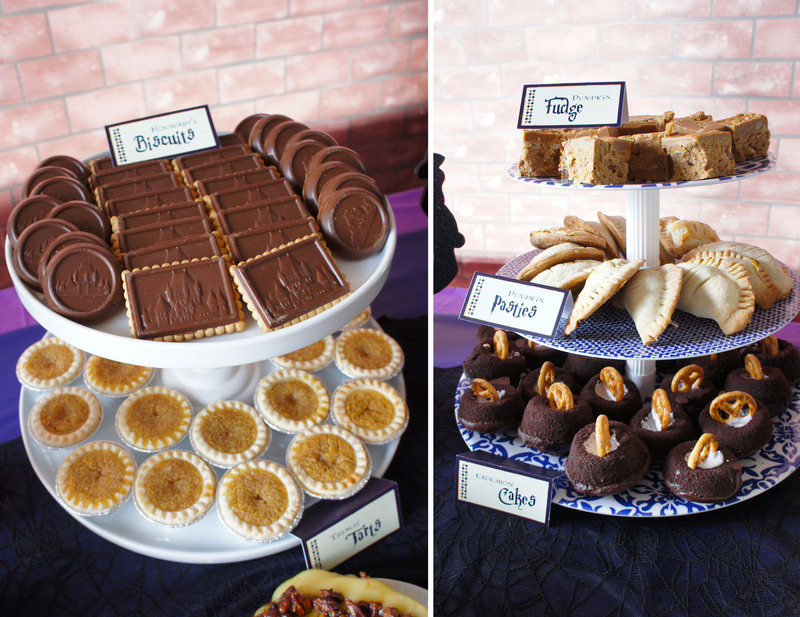 Of course there were also plenty of desserts. My co-host brought delicious pumpkin pasties and cauldron cakes, while I baked up Pumpkin Fudge and the Treacle Tarts. We also had “Hogwarts Cookies” which were simply the Celebration brand cookies that come nicely imprinted with a castle image right in the chocolate! My treacle tarts recipe comes from the Kitchen Magpie. There are many different treacle tart recipes out there, but I knew I needed to try this one when I saw she was another local Edmonton blogger. 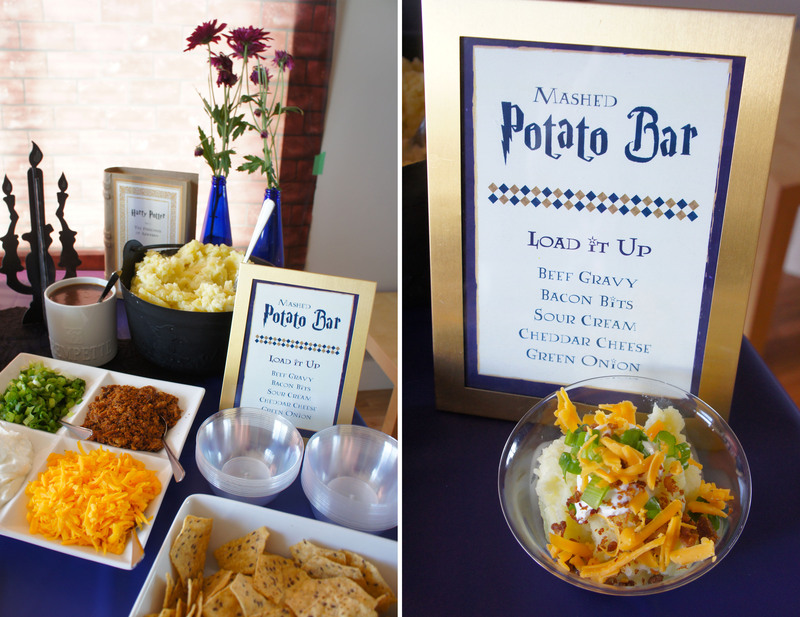 She also has some other great Harry Potter party ideas, so be sure to check her out. I was expecting something close to a buttertart, but they have more of a creamy lemon flavor. I didn’t make it to the British import store to buy the actual treacle and corn syrup recommended in the recipe, but I think they were still authentic enough to pass for my Harry Potter party. In a large bowl, combine the corn syrup, half and half, lemon zest, lemon juice, molasses, melted butter,egg and bread crumbs. Mix thoroughly. Place the tart shells on a cookie sheet and fill each to the brim with the syrup mixture. Bake in the oven for 13-15 minutes, until the tarts shells are lightly browned and the mixture is bubbling. Enjoy either warm or cold, with or without whipped cream on top. These, and other Harry Potter food ideas, can all be found on my Pinterest planning board. 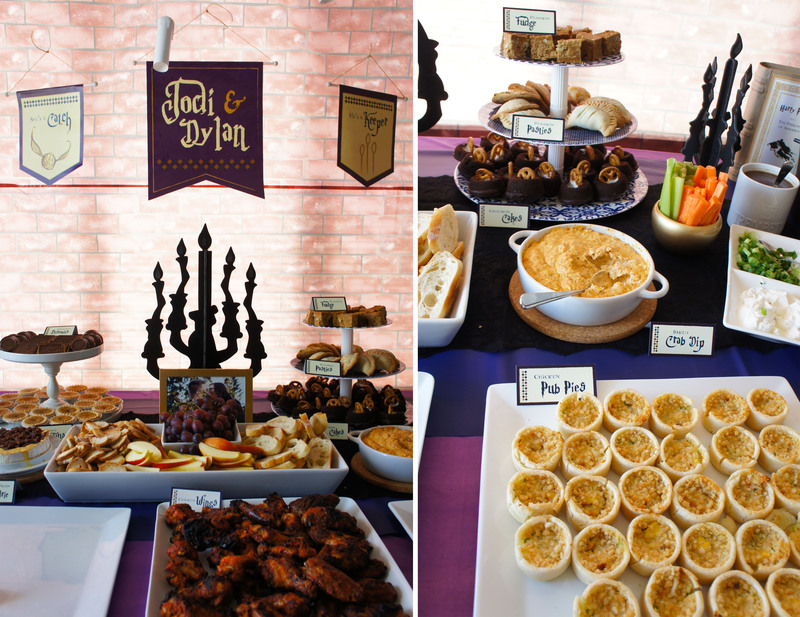 And if you haven’t already seen all the details of my Harry Potter Wedding shower, please click here.